One of the primary concerns of any pet owner is the amount if effort required for grooming, care and upkeep. 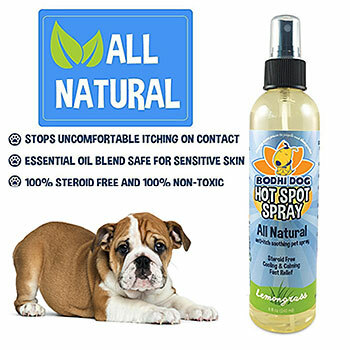 Ask a Bulldog owner about caring for his pet pooch and his answer will usually be “What effort?” The Bulldog is one of the easiest breeds to groom. Being short-haired dogs, their coats are easy to maintain. 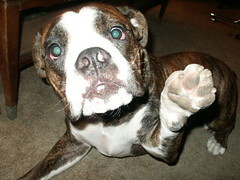 Regular brushing with a firm bristle brush should suffice as part of the bulldog care program. And your bulldog will love being brushed and scratched, so don’t be surprised if he brings over his brush three times a day and lays it at your feet! A weekly bath is great but not necessary unless you are living in especially hot climates. Those Cute Wrinkles need special care. In fact the only facet of your pet Bulldog that requires regular special attention is the folds of skin on the Bulldog’s face. Those cute wrinkles on his face need to be wiped daily and kept dry. 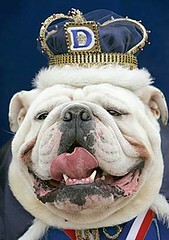 Also, don’t be overly surprised if you see your bulldog sprouting a few pimples every now and then. 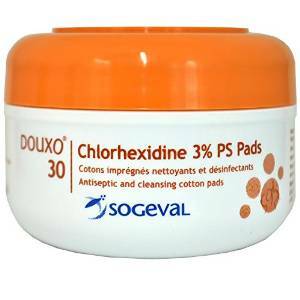 Use Duoxo Medicated Pads to wipe between the folds of skins. Apply some Vaseline to waterproof his facial skin if you like. Desitin is another favorite of Bulldog owners to keep the skin folds dry and to treat minor sunburns and similar skin irritants. If you can, apply some every night after you wipe that cute face! Also, while cleaning, make sure you check between the folds carefully to ensure there are no signs of infections or inflammations. If you find any inflamed, bald or reddish brown patches, trot your pooch over to the Vet immediately. These ‘hot spots’ are cause by severe dermatitis and are extremely painful and itchy and need to be treated without delay. Also, it will be a good idea to keep your pet away from any known skin irritants, especially when outside the house. 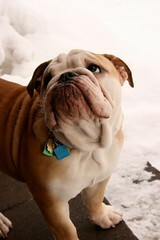 CC photo credit: andrewrThe Bulldog breeds fair well in mild weathers that are reflective of their mild natures. Due to their short spouts, they are prone to developing heat strokes quite quickly in hot weather conditions. And they dislike the cold. Being hairless, your little pet has virtually no protection against the cold to speak of and can easily catch a cold. This combined with the other host of breathing problems that they are genetically prone to, your find your bulldog wheezing like an asthma patient if he catches that dreaded cold! Keep your bulldog in the cool comfort of your home during the summers and by the heater during the winters if you want her to remain happy and healthy. While those puppy dog eyes will have you melting at the most inappropriate moments (read: when you’re trying to disciple them! ), they need to be cared for. Just like you, your dog’s eyes are easily irritated by dust, pollen and other things flying around in the air. 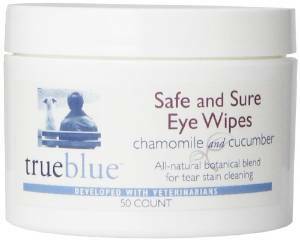 Rinse out your pet’s eyes with a cleaning solution like Safe and Sure Eye Wipes, if your find his eyes are red or watering. Any kind of discharge should be rated immediately. Clean out the eyes with warm water and consult a Vet. 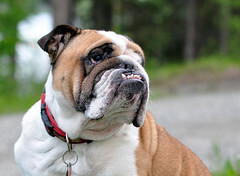 bulldogs have a whole gamut of mouth and throat problems that they are genetically prone to. 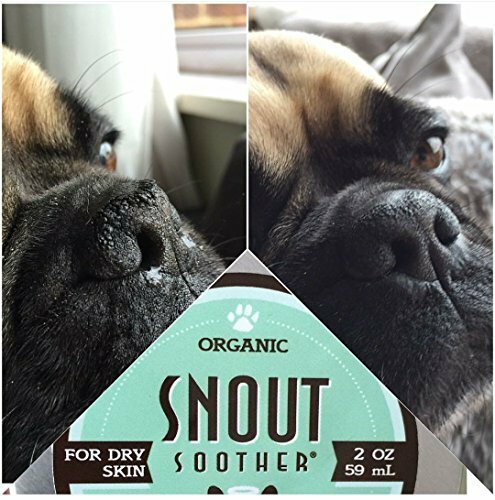 If your hear your dog’s bark is especially muffled or he is continually clearing his trouble in order to get rid of the phlegm stuck there, squirt some Plastic RealLemon liberally into the back of his throat. If you find that your pooch is coughing too, giving him a few doses of Triaminic will act as an expectorant and provide him with some relief. While they love to jump around and will get excited quickly around their owners, their respiratory tracts can’t keep up with your bulldog’s playfulness. Also, it doesn’t help that your mutt will want to put his inquisitive nose into every bush and hole to aggravate his breathing problems. If you find your pet snoring, wheezing or tiring easily, let your Vet give him the once over. CC photo credit: Rhea C.
No one knows why but bulldogs are prone to having Interdigital Cysts. If you see an angry red spot crop up between your bulldog’s toes, then get out that magnifying glass and ensure there are no foreign particles stuck there. Then clean out the area thoroughly with water or baby wipes and slap on generous amounts of drying foot powder such as Desenex. You will need to do this exercise at least once or twice a day until the cyst clears up and a few days after as a precautionary measure to prevent it from recurring. Catching it early is the trick to prevent it from turning into a full scale infection. It is important to remember though that your Bulldog needs to be fed well and appropriately. They need a well-balanced and nutritious diet, but make sure you don’t end up over-feeding your pooch.